In the previous article on How to Buy Yixing Teapot and Cups, we discuss things to consider when buying a Yixing tea ware. In this article, I will explain in more details what the engraving on the tea pot means. This is important, because a high quality pot is handmade, and the engraving identifies the potter. Making yixing pottery is different. The same person is involved from start to end. Therefore each item is closely linked to its maker. 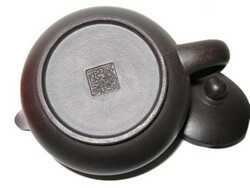 The breakthrough happened in Ming dynasty, when engraving becomes an important part of Yixing tea pot. Being a good potter is not enough. All the important masters of last few hundreds years were eminent engravers, with a number of them being outstanding calligraphers and painters. Today, this has important implications. Calligraphy cannot be easily mass-produced, so it is an important sign of quality. What get engraved may be the name of the artist, the date of manufacture, the name of the commissioner. Today, you often find engraving on the main body of the Yixing tea pot. They are usually poetry or painting. By Qing dynasty, seals have gained widespread acceptance. They have several advantages over free style engraving. First, they are more easily mass-produced. Second, the potter needs not be a trained calligrapher. He just needs to be a good potter. Seals are usually found at the bottom of the tea pot. In the older tea pots, they can also be found below the lid or below the handle. They can have many different shapes: square, round, rectangular and oval. The main content is the name of the potter, but it can also include date of manufacture, name of workshop and location.